From I-70 take the Wamego exit #328 north on K-99 for approximately 9.5 miles and cross the Kaw River bridge into Wamego. Continue north on K-99, which is now called Lincoln Ave to 5th Street. Turn left (west) on 5th Street, this becomes Military Trail Rd. 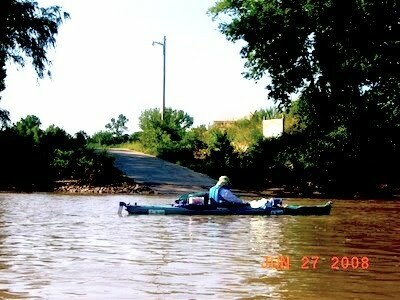 that follows the north bank of the Kaw for 7 miles. In St. George continue past the Post Office on 1st Street, to Lincoln Street (landmark is the old gas station) and turn south. Go about 1\3 mile (cross the railroad tracks) and follow the road staying to the right. Parking lot accommodates 15+ cars. From Manhattan take U.S. 24 approximately 7 miles east and turn south on Military Trail Road or Flush Road. Follow the signs into St. George. Access is fully developed with restrooms, shelter, trees, barbeque, picnic tables and security lights. The ramp is 15 feet wide and 135 feet long with a 12 % grade. This ramp was the first Kaw River access developed by Friends of the Kaw in conjunction with the City of St. George, Westar’s Green Team and many community members and businesses. The ramp was completed in January of 2003. 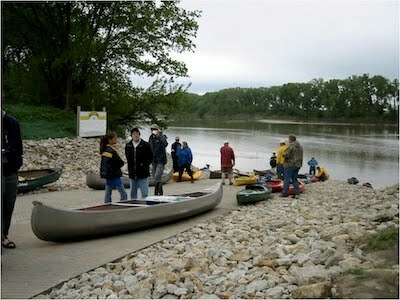 The next access is the Wamego 8.5 miles downstream at river mile 128. The first access upstream is Linear Park in Manhattan at river mile 147.5. To print this page use the button found at the bottom of this page.